Medusa just can’t catch a break. She’s been dealing with one new crisis after another ever since 2013’s Infinity event destroyed her home, leaving the queen without a husband or a kingdom. And while she’s recently regained both, her world is still a pale comparison to what she had before. 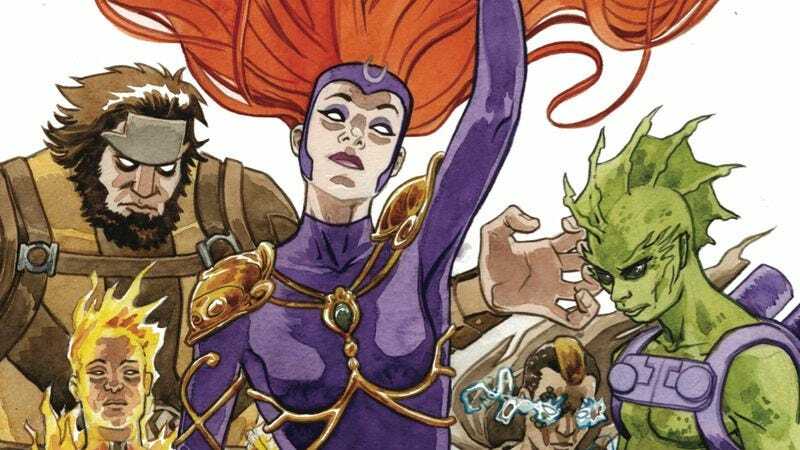 Medusa has been the most intriguing aspect of Charles Soule’s Inhuman, which is good because she’s the central figure of the story. The rest of the cast is largely populated by NuHumans (the name given to those recently transformed by Black Bolt’s Terrigen bomb), but none of those characters have the dimension and pathos of the overwhelmingly coiffed monarch. A major theme of this title is that it’s hard being in control. You have to maintain peace and order while dealing with schemes hatched by those hungry for your power, and that’s when you’re not the leader of an entire species descended from prehistoric humans that were experimented on by aliens. Those circumstances provide the constant stream of problems Medusa has to deal with, and in next week’s Inhuman #13, a fellow Inhuman manipulates her because she’s so committed to protecting the future of her people. The duplicitous Lineage leads the queen and a small group through the mouth of Eldrac, an architectural Inhuman with the ability to teleport people, and while this preview doesn’t reveal what Medusa finds on the other side, with her luck it’s probably going to be more trouble.